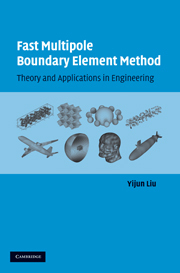 This is the first book on the fast multipole boundary element method (BEM), which brings together the classical theories in BEM formulations and the recent development of the fast multipole method. Two- and three-dimensional potential, elastostatic, Stokes flow, and acoustic wave problems are covered, supplemented with exercise problems and computer source codes. Applications in modeling nanocomposite materials, bio-materials, fuel cells, acoustic waves, and image-based simulations are demonstrated to show the potential of the fast multipole BEM. This book will help students, researchers, and engineers to learn the BEM and fast multipole method from a single source. Go to Cambridge University Press website. Go to Amazon.com (Order from: United States; Canada; China; France; Germany; Japan; United Kingdom). Appendix B.1 A Fortran Code of the Conventional Boundary Element Method for 2D Potential Problems (Click here to download. File updated 10/21/2010). Appendix B.2 A Fortran Code of the Fast Multipole Boundary Element Method for 2D Potential Problems (Click here to download). Go to the Fast BEM Software page to download the other executable BEM programs applied in solving the examples used in the book. Click here for a current list of corrections. Let the author know if you find any errors or typos in the book or the computer codes. Thanks in advance! Last updated: August 25, 2016. © 2009-2013 Yijun Liu, University of Cincinnati, All Rights Reserved.